My new office has been asking me to bake something for them, many co-workers having stumbled across this blog and wondering why they have thus far been left out of the joy of eating caitybakes. So I took a little inspiration from the fact that it's been all summery lately. Makes sense, since it's summer, but the weather really has been superb. 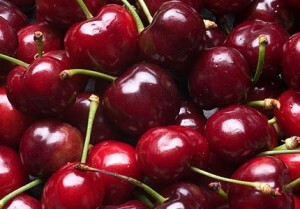 And accordingly our fridge has been stocked with cherries. 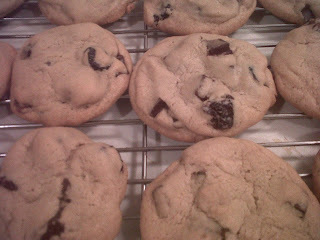 Enter the Triple C: Chocolate Cherry Cookie. They're big, they're chocolately, they're cherry-y. 2. Blend sugars and butter until smooth. Beat in vanilla and eggs until creamy. 3. Sift together flour, soda and salt and add to butter mixture, beating until well combined. Stir in chocolate and cherries. 4. Drop dough by 2 Tablespoon-fuls onto un-greased cookie sheets, leaving about 2 inches between each dough ball. Chill filled cookie sheets for 20 minutes (10 if in freezer) before putting in oven. *Dough can also be chilled before dropping onto sheets. 5. Bake at 325 for 17-19 minutes until edges of cookies appear lightly toasted. Allow cookies to cool on pan for 2 minutes before transferring to wire cooling racks.